His eyes roamed around the room and he shook his head in disgust. He knew most of the girls; he had met them at one or the other party. They were all shallow, selfish and narcissist creatures that bored him to the core. When he couldn’t imagine spending ten minutes in their company, how could he spend the rest of his life with them. His disgust began to metamorphose into a panic attack as he remembered his promise. “I leave it to you to select my bride. I am sure you know my choices better than anyone in the world.” He had told his father exactly seven years ago. And as the heir to the multibillion dollar steel empire that his father had built up from scratch, he had his pick of girls if he chose. And he had to choose today from this pack of girls. He glared at his father, who was seated on the mezzanine level that overlooked the ballroom along with his mother. Promise or no promise, he wouldn’t, couldn’t choose one of these giggling, silly girls as his wife. His wicked father flashed a grin at him, raised his thump wishing him luck and winked. What nerve! Rajeev cursed himself for falling into his trap and walked towards the bar. Seated on the bar stool, caring not a thing about the world and engrossed in relishing the red wine in her hand, was a girl in red. His face lit up with a smile as he recognized who it was- Diya, his nemesis in a sense. The only person who was capable of making his blood boil with her opinions and speeches. But he loved that spirit of hers, it made him feel alive. Unfortunately, she was forbidden to him, as she was a protégée of his father, an orphan whose education he was sponsoring. When she turned to face him, she smiled her lopsided smile, which meant she was having the time of her life laughing at his predicament. “So prince Charming, found your princess?” she asked, her smile now breaking into an obnoxious chuckle. “Come dance with me,” he said. “Hey, hey… I am not one of those silly girls who want to be your princess. I am the devil as you have named me. I am not princess material Mr. Prince. Uncle knows that quite well. He asked me to be here to make sure you choose the right girl,” said she, but Rajeev pulled her onto the dance floor and twirled her around. The wine glass threatened to spill over and Rajeev summoned a waiter and relieved her from the menace. But she was not pleased. “You know what, I prefer to taste that exquisite red wine than make a fool of myself dancing in this appalling red dress. I will trip over this damn thing any moment, Raj. Please stop,” cried Diya. Suddenly the music changed and the orchestra began playing a waltz and Rajeev instantly pulled her near. 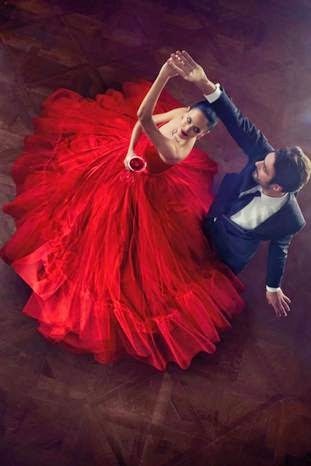 Her proximity wracked his inhibitions and he allowed himself to breathe in the essence of his girl in red, the one who never failed make his heart throb wildly. As the dance progressed, she began to talk, the girl could never keep her mouth shut for more than a few seconds. Every syllable of her words played a different chord in his heart. As though the twinkle in her eyes had magic, as though her moist lips were inviting him, he closed the distance between them and covered her lips with his. He had expected fireworks from her. But to his delight, she kissed him back ardently. As he deepened the kiss, he knew he had found his Princess. The chime of the clock striking twelve brought them back to their senses and he examined the face of his princess- his Cinderella- to look for any sign of disapproval. Unlike Cinderella, his princess appeared in no hurry to leave. When Rajeev looked up at his father, he sniggered. Like the good old king in the story of Cinderella, his father was celebrating. He raised his champagne glass towards Rajeev and beamed like Cupid at the end of a mission of love. Awwww! I loved it, Preethi :) That was one sizzling romance!